The graceful curve of this unique Sperm Whale's Tooth just seems to lend itself to an etching of one of America's beautiful Grand Banks Fishing Schooners. The back of the tooth is left natural, allowing you to pick it up and feel the roughness of the original surface. This tooth is done in the stippled technique in black. It is 4 inches long and 1 1/2 inches wide. This is a legal tooth, registered with the U.S. Department of Commerce as #21-220.0002. A handmade Sterling Silver base, made especially for this tooth, can be yours as an additional option. 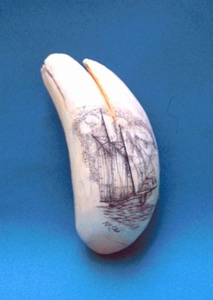 A marvelous piece that will be much appreciated by any scrimshaw collector.